One component of our homeschooling is nature walks. We get outside, enjoy fresh air, and learn about the world around us. We often have several things we need to carry with us for our nature walk time. Instead of packing and unpacking a bag every week, I set up a Nature Walk Bag with some of our important items we need most often. This simple act of organizing our nature walk materials has saved my sanity! We have everything read to grab and go. 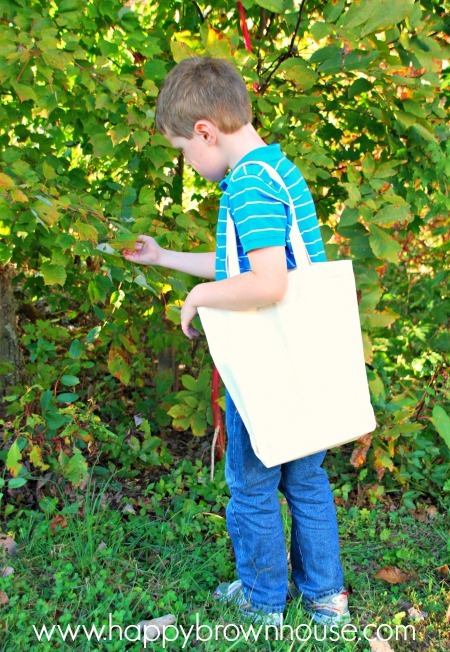 What’s in our Nature Walk Bag? Science Journal–we use this to write or draw things we saw on our nature walks. It may be making a list of the bugs we saw, sketching an interesting flower, or doing a bark rubbing, but we always try to journal about our time outside. The kids also record our science experiments in this journal. For example, the picture below shows the journal page after our Testing for Air Science Experiment. 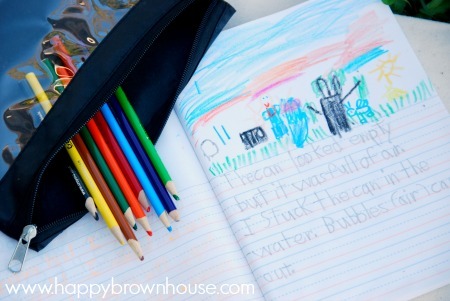 Writing Utensils–I put a few pencils and colored pencils in a small pencil bag. I chose colored pencils so I wouldn’t have to worry about melting crayons if I left it in the van. Binoculars–Part of the reason we have binoculars is because my oldest thinks he needs them for an exploring adventure, but we normally use the binoculars to look at birds or animals from a distance…of course, that depends on how quiet the kids can be before scaring them off. Bug Catching Kit–My boys love bugs. It is easier to observe insects when you can catch them and get a closer look. We always release them into the wild so they can go about their business. 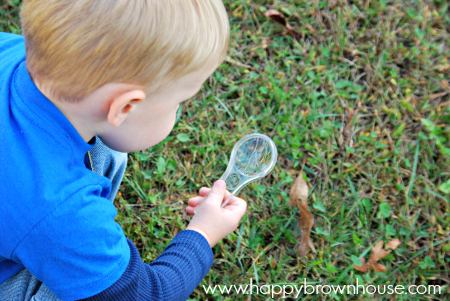 Magnifying Glasses–Once again, the boys turn into little explorers when they can “play the part” with a special tool. We use these to look at bugs, tree bark, flower parts, and the veins of a leaf. Kid Friendly Field Guide–By having a field guide in our bag, we can look up birds, plants, and more. Learning how to use a reference text like this to find information is a skill everyone should have. We use and love the Fun With Nature Take-Along Guide. It is a compilation of 7 books: Caterpillars, Bugs and Butterflies; Frogs, Toads and Turtles; Snakes, Salamanders and Lizards; Rabbits, Squirrels and Chipmunks; Tracks, Scats and Signs; and Trees, Leaves and Bark. We also use More Fun With Nature Take Along Guide. It is a compilation of five other Take-Along Guides. It includes: Berries, Nuts and Seeds; Birds, Nests and Eggs; Rocks, Fossils and Arrowheads; Seashells, Crabs and Sea Stars; and Wildflowers, Blooms and Blossoms. Note: Depending on what we are studying, I choose one of these books. I don’t want to be carrying a heavy bag for long! And let’s face it…mommas end up carrying these sort of things most of the time. Nature I-Spy Cards–I printed the Nature I-spy Cards from Nature Study Printables for Toddlers and Preschoolers written by friend Maureen over at Spell Outloud. I placed them on rings so they wouldn’t get lost. Little Brother likes these the most. Need more Nature Study ideas? 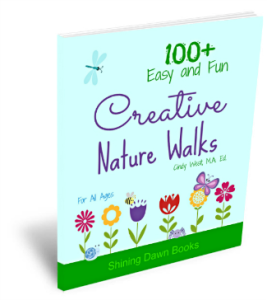 Creative Nature Walks has over 100 nature walk ideas that are easy to do! If I didn’t have this ebook and so many of Cindy’s wise words, I would seriously wander around with the kids looking at the same things every week. 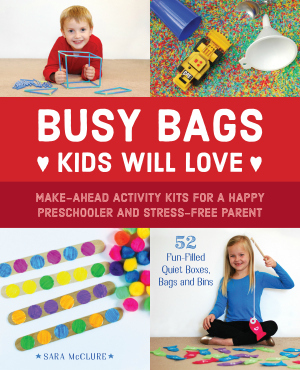 Cindy has some fantastic ideas packed in this resource. If you are new to nature walks or just need a fresh idea, this is for you. Cindy is my go-to person for Nature Study. She has a ton of nature study resources available! 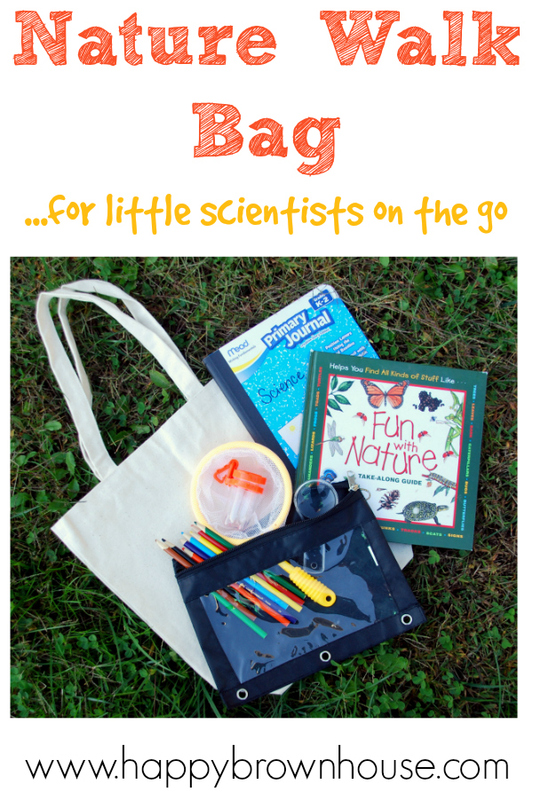 You have inspired me to make a science discovery bag to take out when my kindergarten class plays/learns outside. I want my scientists to have access to some tools of inquiry. Thanks for the gentle prod to get this ready for my students. You are welcome Sandi! Glad you found inspiration here! Love this!! We always take a bag out with us on hikes and nature walks. As the kids get older, you’ll find your contents will change somewhat, but the idea and reason is still there.